We are garage door specialists with a focus on Liftmaster openers. Contractors of every description swear by Liftmaster for very good reasons. One of them is the fact that it is this brand that has produced one of the greatest garage door openers in the current market. Not only is it a strong brand associated with highest quality, it is also well known for providing value for money. This is the type of garage door accessory that endures on for years and years without fail. 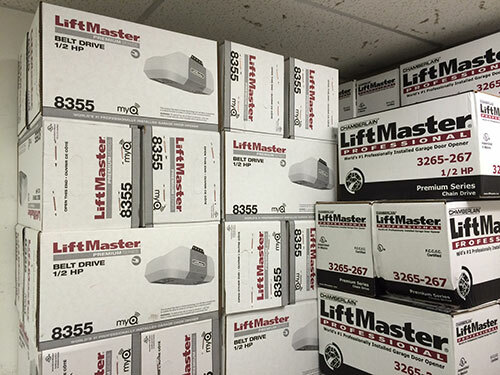 At the same time the wide variety of Liftmaster products that are available provides property owners the flexibility to choose the exact item that they are looking for at any given moment in time. The Liftmaster 8550 Elite Series is a notable example of what this brand brings to the table. Together with the equally effective companion DC Battery Backup Belt Drive, these products create a winning combination that brings together traditional design elements with modern technology. It essentially means that the operation of the garage door is not restricted to when power is on since there is an effective backup. The addition of MyQ technology has also been instrumental in terms of reaping the benefits of a Smartphone that can now be used to control the security arrangements on your property at a click of a button. The latest Liftmaster openers have excellent connectivity and can be linked up to laptops, computers, or even tablets depending on how you want to control them. Through testing, it has been possible to bring together a comprehensive security system that incorporates lights and touch sensitivity. At the same time Liftmaster is more than happy to provide the basic openers that can do the work of opening and closing manual doors. This range of technical efficiency and effectiveness is one of the principal reasons why the brand is enduringly popular with both property owners and contractors who are looking for value. Although the attached DC motor belt drive system is both quiet and relatively efficient, setting it up requires quite a bit of preparation and the aid of a good manual. On the other hand the Lifetime motor is quite solid but you must ensure that you maintain it as directed or else you risk having to pay for its replacement before time. We consider the Security+ 2.0 additions to be a great bonus for property owners but at the moment it is not yet fully clear how it operates and the technology might be a bit too advanced for some people. The first thing you need to do is fully understand the opener and how it operates. You can then set up a maintenance schedule that addresses each constituent part. The fact that there is lots of customization means that the one-size-fits-all dogma is not going to work here. However you can do the general things like checking the electronics and keeping the opener generally clean. Garage Door Repair Anthem offers a complete care program that incorporates installation with general maintenance. Expert technicians will resolve virtually anything that can go wrong with a Liftmaster opener.